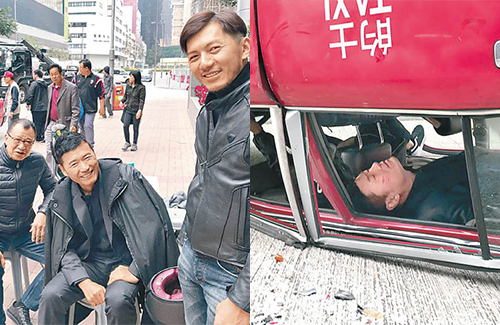 Michael Miu (苗僑偉) declined the help of a stunt double when he and costar Hui Shiu-hung (許紹雄) shot a car chase scene for the Shaw Brothers web drama The Protector <守護神>. The scene being filmed was about Micheal’s car toppling over after getting hit, and he falls to the ground unconscious. It was the drama’s last scene before wrap-up. His wife Jaime Chik (戚美珍), his Line Walker: The Prelude <使徒行者2> costar Benjamin Yuen (袁偉豪), and The Protector producer Virginia Lok (樂易玲) were on set to visit the drama’s final scene being filmed. After ending the scene, the director announced that the show has wrapped up, and Michael popped a champagne bottle for celebration.